Role of lipid molecules in tumor cell biology: old facts and new perspectives. 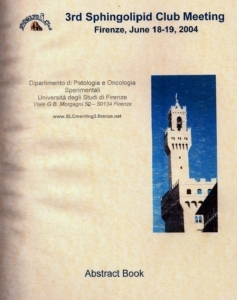 Department of Experimental Pathology and Oncology, University of Florence, ruggieri@unifi.it, tel. 055 4282323, fax 055 4282333. Studies of tumor lipids have developed in step with those regarding the role of lipid molecules in cell biology. The parallel development of these studies has represented an interesting example of a fruitful interaction in the investigation of cell physiology and tumor biology. In the sixties, the explosive interest in cholesterol regulation in the body in order to understand the pathogenesis of atherosclerosis led to the discovery that hepatomas lack the feedback inhibition of cholesterol synthesis. Much attention has been devoted to phospholipids in tumor cells, due to the recognition that phospholipids are essential membrane components involved in enzymatic activities, receptorial properties, cellular permeability -- all of which are implicated in tumor cell biology. Structural analyses of phospholipids in different types of tumors revealed a profound alteration in their diacyl choline-glycerophospholipid molecular species. These analyses also showed an accumulation of ether-linked lipids in tumor cells, particularly evident in those with a high metastatic potential. This finding stimulated a great deal of research on the biosynthesis, distribution, and biological functions of ether-linked lipids. Moreover, awareness that glycolipids and gangliosides are involved in cellular recognition, particularly in the altered social behavior of tumor cells, has opened the way to understanding the complexity of the family of glycolipid molecules, for which Hakomori’s great contribution should be aknowledged. Unlike phospholipids, a specific glycolipid pattern was not found in different tumors examined. In fact, the glycolipid biosynthesis exhibits a lineage-dependent specificity which leads to peculiarities in the glycolipid patterns in tumor cells of different origin. For instance, a reduction of the more complex gangliosides in virally-transformed cell lines has been reported by different laboratories, while an accumulation of fucose-containing glycolipids has been noticed in epithelial tumors of a different origin. Moreover, in a fibrosarcoma line, the metastatic properties appeared to be correlated with the content and cell surface expression of Gb3ose, a glycolipid characteristic of this line. The tremendous expansion of research on inflammatory lipid mediators (platelet-activating factor, prostaglandins, thromboxanes, leukotrienes, hydroxyeicosatetraenoic, lipoxins) showed the importance of these mediators in several homeostatic reactions, including some which are implicated in various aspects of tumor progression, such as inflammatory processes, immunological responses and activation of platelets and endothelial cells. Several laboratories documented the involvement of arachidonic acid metabolites in growth rate and metastatic diffusion of tumor cells. Concentratingon the role played by platelet-activating factor (PAF) in certain steps of metastatic diffusion, we observed that: a) PAF is synthesized by different transformed cell lines under basal conditions and after stimulation with cytokines; b) PAF influences the interaction of melanoma and colon carcinoma cells with adhesive proteins of endothelial cells; and c) PAF promotes mobility of tumor cells by influencing the cytoskeleton. The long-lasting consensus on the pro-tumoral activity of high fat diets focused attention on the different families (n-6, n-3) of polyunsaturated fatty acids (PUFA) as possible modulators of tumor progression. Indeed, contrasting effects on carcinogenesis and metastatic diffusion were observed in animals fed diets enriched with different families of PUFA : stimulatory with PUFA n-6, inhibitory with PUFA n-3. A further insight on the role played by lipid molecules on carcinogenesis and tumor progression will be offered by the incoming investigation on the influence of lipid molecules on gene expression. This consideration is sustained by the recent report that the antitumoral effects of certain PUFA are mediated by peroxisome proliferator-activated receptors, a ligand-activated nuclear receptor superfamily which plays a regulatory role in several biological responses. Biophysical properties of short- and long-chain ceramides. Goñi, FM, Contreras, FX, Montes, LR, Sot, J and Alonso, A.
Unidad de Biofísica (CSIC-UPV/EHU) and Departamento de Bioquímica, Universidad del País Vasco, Bilbao, Spain. In the past decade the long-neglected ceramides (N-acylsphingosines) have become one of the most attractive lipid molecules in molecular cell biology, because of their involvement in essential structures (stratum corneum) and processes (cell signalling). Most natural ceramides have a long (16-24 C atoms) N-acyl chain, but short N-acyl chain ceramides (2-6 C atoms also exist in nature, apart from being extensively used in experimentation, because they can be easily dispersed in water. Long-chain ceramides are among the most hydrophobic molecules in nature, they are totally insoluble in water and they hardly mix with phospholipids in membranes, giving rise to ceramide-enriched domains. In situ enzymic generation, or external addition, of ceramides in membranes has at least three important effects: (i) lipid monolayer tendency to adopt a negative curvature, e.g. through a transition to an inverted hexagonal structure, is increased, (ii) bilayer permeability to aqueous solutes is notoriously enhanced, and (iii) transbilayer (flip-flop) lipid motion is promoted. Short-chain ceramides mix much better with phospholipids, promote a positive curvature in lipid monolayers, and their capacities to increase bilayer permeability or transbilayer motion are very low or inexistent. Subcellular distribution of neutral ceramidase: localization to the outer mitochondrial membrane of rat liver. *&°Porcelli AM, §Novgorodov SA, *Luberto C, &Rugolo M, §Obeid LM,and *Hannun YA. *Department of Biochemistry and Molecular Biology and §Department of Medicine, MUSC, Charleston, SC (USA); &Dipartimento di Biologia E.S., Università di Bologna, Bologna, Italy. Ceramide, sphingosine and sphingosine-1P play important roles in the regulatory functions of cellular processes such as apoptosis, proliferation and differentiation. Ceramidases (CDases) are the enzymes that hydrolyze ceramide to free fatty acid and sphingosine, thus contributing to change the intracellular levels of these bioactive molecules. These enzymes have been classified in three groups: acid, neutral and alkaline. Although the acid and alkaline CDases appear to be clearly localized to the lysosomes and ER/Golgi, respectively (1-3), the intracellular localization of the neutral enzyme is not clear. In this regard we had noted from our own studies (4) and from published studies a significant variation in the subcellular localization of neutral CDase when overe-xpressed in various cell lines. The aim of this work was to define the intracellular localization of endogenous CDase and toreconcile the results from tissue culture studies with subfractionation results. Rat liver subfractions were prepared using differential centrifugation and subsequent separation of pure mitochondria on Percoll gradient. CDase activity assay using D-e-C12-NBD-ceramide as substrate revealed that the activity was enriched in the pure mitochondrial fraction. Further, submitochondrial fractionation using digitonin showed that the enzyme resided preferentially in the outer mitochondrial membrane. Western blot analysis also supported these results and indicated that the molecular mass of neutral CDase in rat liver is around 85kDa. Unlike liver, most cell line are not very rich in mitochondria, and we hypothesized that whereas mitochondria may be enriched in the enzyme, over-expression may overwhelm the transfected cells. Therefore we investigatedthe subcellular localization of human neutral CDase in HEK 293 cells after transfectionwith GFP empty vector or vector in which GFP was at the C-terminus of human CDase. Subcellular fractionation of HEK cells showed that the specific activity of neutral ceramidase was highest in mitochondria. Nevertheless, mitochondria accounted for only a small fraction of the total activity. Confocal microscopy revealed that the over-expressed CDase exhibited a tubular pattern in the cytoplasm in close proximity to mitochondria and partially colocalized with an ER marker protein. All together these results indicate that the endogenous neutral CDase is enriched in mitochondria from rat liver, and that the over-expression of the enzyme likely causes a mislocalization. This finding warrants caution in interpreting results from over-expression studies, in particular when applied to membrane-bound proteins. Sugita M, Dulaney JT, Moser HW. Ceramidase deficiency in Farber’s disease. Science. 1972; 178:1100-1102. Mao C, Xu R, Szulc ZM, Bielawska A, Galadari SH, Obeid LM. Cloning and characterization of a novel human alkaline ceramidase. J. Biol. Chem. 2001; 276:26577-26588. Mao C, Xu R, Szulc ZM, Bielawska J, Becker KP, Bielawska A, Galadari SH, Hu W, Obeid LM. Cloning and characterization of a mouse endoplasmic reticulum alkaline ceramidase. J. Biol. Chem. 2003; 278:31184-31191. El Bawab S, Roddy P, Quin T, Bielawska A, Lemasters JJ, Hannun YA. Molecular cloning and characterization of a human mitochondrial ceramidase. J. Biol. Chem. 2000; 275: 21508-21513. Gangliosides are present in all subcellular fractions of rat liver. The site of biosynthesis of gangliosides has long been thought to be exclusively the Golgi apparatus and their localization to be mostly at the outer surface of plasma membranes. However, recent evidence suggest that the mitochondria-associated membrane (MAM) can also synthesize gangliosides. Moreover, the presence of gangliosides has been documented in mitochondria and nuclei. In order to gain insight on the presence of gangliosides in subcellular fractions, we have carried out analyses of the gangliosides isolated from highly purified subcellular fractionsof rat liver. The major gangliosides species of the total rat liver were GD1a>GM1>GM3>GD1b>GT1b>GD3>GM2. Gangliosides were identified by co-migration with standards and by immunostaining on thin-layer plates with specific antibodies. The subcellular fractions purified from rat liver were the following : whole mitochondria, mitochondrial outer and inner membranes, mitochondria-associated membranes (MAM), microsomes, Golgi apparatus, nuclei and plasma membranes. All subcellular fractions analyzed were found to contain gangliosides. The ganglioside contents and the quantitative patterns were different in each organite, but no qualitative differences could be observed. Our results show that gangliosides are present in all cellular membranes, but the respective patterns do not reflect the global ganglioside composition of a tissue. Sphingomyelin metabolism changes after serum deprivation in neuronal cell nuclei. Albi E1, Cataldi S 1, Bartoccini E1,Mazzoni F 2, Voccoli V3, Viola Magni M1,Lazzarini R1, and Garcia-GilM2. Department of Biochemical Sciences and Molecular Biotechnology, Physiopathology, Policlinico Monteluce, 06100, Perugia;2) Dpt. of Physiology and Biochemistry, University of Pisa, 3)Institute ofNeuroscience, CNR, Pisa. We have previously shown that in murine embryonic hippocampal HN9 cells, serum deprivation induces variations in the nuclear enzyme activities involved in the sphingomyelin (SM) metabolism. Nuclear sphingomyelinase (SMase) increases biphasically, with an earlier peak one hour after serum deprivation, and a secondraise starting at 15 hrs. In contrast, nuclear sphingomyelin-synthase (SM-synthase) decreases after serum deprivation with a minimun after 1 hr. No variations of SM metabolism were observed in the homogenate. The aim of this work is to clarify if the enzymes present in the nuclei differ from those present in the homogenate on the basis of the physical chemical parameters of the SMase and the SM-synthase in homogenate and nuclei isolated from HN9 cells and so to ascertain the specificity of the above modificationsandevaluatethe SM and ceramide content changes in relation to the serum deprivation-induced apoptosis. 3H-PC and 14C-SM were used as precursors to evaluate the SM-synthase and SMase activityrespectively. The neutral SMase and SM-synthase have a pH optimum 7.2 in homogenate and 7.6 in nuclei, whereas the acid SMase, measured in the homogenate, has a pH optimum 5.00.Their activity is linear during the first 60 min and in the range from 50 to 200 mg protein. The enzyme activities obey a regular Michaelis-Menten kinetics in both preparations. The Km values of the neutral SMase are 1.48 x 10-3M for the homogenate and 1.26 x 10-4 M for nuclei whereas that of acid SMase is 4.55 x 10-5 M. The Vmax were 344, 113 and 183 pmol/mg protein/min respectively. The Km values of SM-synthase are 4.6 x 10-3M for homogenate and 1.59 x 10-4 for nuclei. The Vmax are 140 and 109 pmol/mg protein/min respectively. The physical chemical parameters of the nuclear enzymes in HN9 cells are similar to those reported previously for hepatocyte nuclei. The lower Kms of the nuclear SMase and SM-synthase indicate a higher affinity for their substrate compared to those of the homogenate. Our results suggest that the enzymes present in the homogenate and nuclei are different. The modifications of nuclear levels of SM and ceramide during the first hours of serum deprivation were studied by labeling the cells with 3H palmitic acid and measuring 3H-SM and 3H-ceramide in the purified nuclei. We have found that aftertwo hours of serum deprivation, the nuclear 3H-SM decreases while 3H-ceramide increases significantly, in agreement with the increase of SMase activity and inhibition of SM-synthase activity inhibited as previously reported. Development of a high throughput screening assay for ceramidases and application to the screening of combinatorial libraries of sphingolipid analogs. Bedia C, Triola G, Badalassi F, Grijalvo S, Casas J, Delgado A, Llebaria A and Fabriàs G.
The first step in the catabolic route of ceramide is its amide hydrolysis by ceramidases. Several types of ceramidases have been reported that differ in their optimum pH, intracellular location and substrate specificity. Mutations in the acidic form gives rise to Farber disease (1), a rare lysosomal storage disorder for which there is no current therapy. A promising novel strategy that has afforded promising results in Gaucher and Fabry diseases is the active site directed chaperone approach. This strategy relies on the use of competitive enzyme inhibitors at sub-inhibitory concentrations to aid the correct folding of the mutated enzyme, thus favouring its transport to the lysosome and increasing its residual activity. Although several inhibitors of ceramidases have been reported (2-4), potent inhibitors of the acidic enzyme are not available. The only acid ceramidase inhibitor so far described is N-oleoylethanolamine, and its potency is rather low (4). In contrast, potent and selective inhibitors of mechanistically similar hydrolases are known (5). In this context, we have recently undertaken a project aimed at the synthesis of combinatorial libraries of sphingolipid analogs with a general structure combining the diverse structural motifs present in reported inhibitors of ceramidases and mechanistically similar amide hydrolases. To identify and select competitive inhibitors within the combinatorial lipid libraries, the development of a high throughput screening (HTS) procedure was necessary. In this work we describe the development of a HTS procedure to determine ceramidase activity and its application to the screening of combinatorial libraries of lipid analogs. As detailed in the figure, the method is based on the Reymond’s concept (6), which consists on the use of a fluorogenic substrate, which, upon amide hydrolysis, affords an aminoalcohol. Its oxidation with NaIO4 gives rise to an aldehyde, which is broken down to fluorescent coumarine in BSA at pH = 8.0. The fluorescent substrate can be easily prepared as outlined in the scheme. 1. He X, Okino N, Dhami R, Dagan A, Gatt S, Schulze H, Sandhoff K, Schuchman EH.J. Biol. Chem. 2003;278:32978-32986. 2. Bielawska A, Greenberg MS, Perry D, Jayadev S, Shayman JA, McKay C, Hannun YA. J. Biol. Chem. 1996;271:12646-12654. 5. Boger DL, Sato H, Lerner AE, Hedrick MP, Fecik RA, Miyauchi H, Wilkie GD, Austin BJ, Patricelli MP, Cravatt BF. Proc. Natl. Acad. Sci. USA. 2000;97:5044-5049. 6. Wahler D, Badalassi F, Crotti P, Reymond, JL. Chemistry--A European Journal. 2002;8:3211-3228. Double strand RNA and sphingomyelin. Rossi G., Viola Magni MP, Albi E.
A complex formed by 97% protein, 1.7% RNA, 0.4% DNA and 0.18% phospholipids (PLs), constituted by sphingomyelin (SM) and phosphatidylcholine (PC), was isolated from hepatocyte nuclei (1). The RNA appeared to be double-strand since was resistant to RNase treatment and became sensitive to enzymatic hydrolysis when submitted to thermal denaturation. The digestion of SM with sphingomyelinase (SMase) trasformed Rnase-undigested RNA in RNase-sensitive RNA, thus suggesting that the SM may form a bridge between two RNA strands (1). The EM analysis, using double labeling with anti-RNA polymerase II antibody and N-SMase-gold complex showed that SM colocalizes with RNA-polymerase II in the transcription sites (unpublished data). The aim of this work was to highlight the relationship between SM and RNA transcription in the intranuclear complex. Hepatectomised animals were killed 24 hrs after operation, 100mCi 3H-uridine was injected 1h prior to killing. The 3H-uridine incorporation value was 1893 cpm/mg RNA in the homogenate and increased by 2.9 and 3.7 times in the nuclei and in the intranuclear complex respectively. The data suggest that the RNA present in the complex is neosynthesised. To investigate if the RNA was synthesised directly in the intranuclear complex, the possible presence of a transcription factor STAT3 was detected by immunoblotting with specific antibodies. The results showed that the STAT3 is present in the intranuclear complex, its molecular weight is 180 KDa which is a dimeric active structure formed in the cytoplasm and transferred in the nucleus. After SMase treatment the dimeric structure decreased strongly and a spot corresponding to 80 KDa, a monomeric form, appeared. It is possible that SM and STAT3 interact in the transcription process and facilitate the formation of the RNA loops. The SMase degrades STAT3 and SM favouring the splicing process. 1) Micheli,M., Albi,E, Leray,C., and Viola Magni,M.P. "Nuclear sphingomyelin protects RNA from RNase action" FEBS Letters 431, 443-447, 1998. Sphingosine kinase as a ‘sensor’ during chemotherapy-induced apoptosis in prostate cancer. Prostate cancer is the most common malignancy and the second leading cause of cancer death in men, killing more than 200,000 men annually worldwide. Many forms of prostate cancer initially are androgen dependent, but the response to androgen-ablation therapy is transient, and after a few years, the majority of prostate cancers relapse to the status of androgen independence resulting in death. Despite the availability of various therapeutic approaches (ionizing radiation, chemotherapy) that kill tumor cells by apoptosis, many cancer cells develop resistance to apoptosis. Sphingolipid metabolites - including ceramide, sphingosine and sphingosine 1-phosphate (S1P)- are active mediators that play essential roles in cell growth, survival and death. Abundant evidence suggests that ceramide is a critical messenger of ionizing radiation- and chemotherapeutic drug-induced apoptosis. In contrast to the growth-inhibitory and pro-apoptotic effects of ceramide, S1P, which is produced by phosphorylation of sphingosine by the oncogenic sphingosine kinase, has been implicated in cell growth and inhibition of ceramide-mediated apoptosis. It has been hence suggested that the dynamic balance between levels of ceramide versus S1P, and consequent regulation of opposing signaling pathways, is an important factor that could determine whether a cell survives or dies. Herein, we report that sphingosine kinase could act as a ‘sensor’ during chemotherapy-induced apoptosis in prostate cancer. In other words, we have found that the chemosensitivity/chemoresistance status is well correlated with sphingosine kinase activity. In prostate cancer cells in which chemotherapeutics induced a strong apoptosis, sphingosine kinase activity was rapidly down regulated. Accordingly, levels of endogenous ceramide and S1P were respectively increased and diminished. Conversely, there were no changes in sphingosine kinase activity (nor in ceramide and S1P levels) in tumor cells in which chemotherapeutics have no or little effect on cell viability. To demonstrate that sphingosine kinase inhibition was instrumental for chemotherapeutic-induced apoptosis, we over expressed its gene in two prostate cancer cell lines.As anticipated, sphingosine kinase overexpression markedly protected cells from chemotherapeutic-induced apoptosis. Ability of sphingosine kinase to determine the resistance of cancer cells to chemotherapy might propose inhibition of this enzyme for potential application in cancer treatment. Strategies that elevate cellular ceramide and diminish S1P by switching off sphingosine kinase could be used for therapies aimed to arrest growth or promote apoptosis. To this end, we have utilized newly developed sphingosine kinase inhibitors to alter this signaling pathway. These inhibitors could successfully overcome chemoresistance by triggering apoptosis in the prostate cancer cell lines used in this study. By its very nature, the sphingolipid biostat is poised for pharmacologic manipulation, and we can anticipate therapeutic success from the thoughtful use of molecules that can interfere with it by inhibiting the key enzyme, sphingosine kinase. Sphingosine 1 Phosphate (S1P) protects mice from the radiation–induced GI syndrome and LPS-induced death. 1Bonnaud S, 1Niaudet C, 2Fuks Z, 2Kolesnick R, 1Paris F.
While ceramide is considered a pro-apoptotic factor, its metabolite, S1P, acts as a proliferative, anti-apoptotic factor. Recent results showed that acid sphingomyelinase gene disrupted (asmase-/-) oocytes and S1P treated oocytes resist radiation-induced apoptosis ex vivo (1). Moreover, in adult mice, oocyte loss, ovarian aplasia and sterility, observed in 0.1 Gy irradiated wild-type mice, were prevented by injection of S1P into the ovary prior to radiation (2). This study showed that S1P might be a promising agent for the protection of critical tissues against toxicity of anticancer drugs. The gastrointestinal (GI) syndrome is a common side effect of anticancer treatments and limits their efficacy. Our previous data showed that microvascular endothelial apoptosis after whole body irradiation at 15 Gy leads to stem cell dysfunction, crypt damage, organ failure, and death from the GI syndrome (3). These events were prevented when endothelial apoptosis was inhibited pharmacologically, by i.v. basic fibroblast growth factor (bFGF) injection, or genetically, by deletion of asmase. bFGF-treated mice or asmase-/- mice died later from bone marrow aplasia. We now report that retro-orbital injection of S1P in wild-type C57Bl/6 mice, prior to irradiation, mimics the effect of asmase disruption. S1P protected mice from death caused by the GI syndrome. Survival of 15 Gy-irradiated mice after S1P treatment was increased (median survival 9 days vs. 6 days for 15 Gy control mice; p<0.05). Autopsies showed that 80% of 15 Gy irradiated animals treated with S1P died from marrow failure rather than the GI syndrome. Furthermore, published data already showed that LPS-induced mouse death by a disseminated form of endothelial apoptosis was mediated through ceramide generation, and inhibitable by bFGF injection or asmase deletion (4). Similarly, S1P-pretreated mice were protected from lethal LPS injection (76% of mice survive 175 mg LPS/25g body weight after S1P pretreatment vs. 19% of control mice; p<0.05). In vivo investigations showed that S1P radioprotection against tissue damage and death in these models is due to direct inhibition of endothelial cell apoptosis. In order to better describe the molecular pathway used by S1P to inhibit endothelial cell apoptosis, we decided to study the effect of S1P in irradiated microvascular endothelial cells (HMEC-1). We first showed that a 15 Gy irradiation kills 40% of cells by apoptosis after 24 hours. Pretreatment with 1mM S1P 2 hours before irradiation was able to inhibit apoptosis by 50% in HMEC-1 cells. In order to know whether the S1P was acting directly against ceramide generation or through S1P receptors and G protein activation, we pretreated endothelial cells with an inhibitor of Gi/G0 proteins activation, the Pertussis Toxin (PTX), before S1P treatment and irradiation. This PTX treatment reverted radioprotection of S1P in HMEC-1 cells. In vivo investigation are underway to determine whether PTX pretreament can block the radioprotection of the microvascular endothelium, tissue damage and death caused by S1P. 1. Morita Y, Perez GI, Paris F, Miranda SR, Ehleiter D, Haimovitz-Friedman A, Fuks Z, Xie Z, Reed JC, Schuchman EH, Kolesnick RN, Tilly JL. Oocyte apoptosis is suppressed by disruption of the acid sphingomyelinase gene or by sphingosine-1-phosphate therapy. Nature Medicine. 2000;6(10):1109-14. 3. Paris F, Fuks Z, Kang A, Capodieci P, Juan G, Ehleiter D, Haimovitz-Friedman A, Cordon-Cardo C, Kolesnick R. Endothelial apoptosis as the primary lesion initiating intestinal radiation damage in mice. Science. 2001;293(5528):293-7. 4. Haimovitz-Friedman A, Cordon-Cardo C, Bayoumy S, Garzotto M, McLoughlin M, Gallily R, Edwards CK 3rd, Schuchman EH, Fuks Z, Kolesnick R. Lipopolysaccharide induces disseminated endothelial apoptosis requiring ceramide generation.J Exp Med. 1997;186(11):1831-41. Sphingosine-1-phosphate signalling in neuronal cells – Studies with a synthetic analogue. Kekulé-Institut für Organische Chemie und Biochemie der Universität Bonn, Gerhard-Domagk-Strasse 1, 53121 Bonn, Germany. cis-4-Methylsphingosine is a synthetic cell permeable pro-drug, that is taken up by cells and phosphorylated to a metabolically stable cis-4-methylsphingosine-1-phosphate (1). This compound was shown to mimic the mitogenic effect of its short living physiological counterpart sphingosine-1-phosphate (S1P) in Swiss 3T3 fibroblasts (2). In neuroblastoma cells, however, cis-4-methylsphingosine-phosphate was found to induce apoptosis and this effect was mediated by an opposite regulation of p38 and of ERK MAPKs (3). We have now investigated the effect of both, S1P and its synthetic analogue in highly differentiated primary cultured neurons. In contrast to S1P, which had no effect on growth of these post-mitotic cells, cis-4-methylsphingosine-1-phosphate induced apoptosis. Like in neuroblastoma cells MAPK pathways were involved in this process. In addition, however, an aberrant activation of the cell cycle machinery was found to be required. Interestingly, our results document that the different physiological effects, apoptosis in case of the accumulating metabolically stable synthetic compound versus no apoptosis in case of the short-living S1P, rely only on nuances of impact. In other words - similar pathways are affected by both compounds albeit in a sustained and more pronounced manner in case of the metabolically stable synthetic compound. 1 - van Echten-Deckert G, Zschoche A, Bär T, Schmidt RR, Raths A, Heinemann T, Sandhoff K. cis-4-Methylsphingosine decreases sphingolipid biosynthesis by specifically interfering with serine palmitoyltransferase activity in primary cultured neurons. J. Biol. Chem. 1997;272:15825-33. 2 - van Echten-Deckert G, Schick A, Heinemann T, Schnieders B. Phosphorylated cis-4-methylsphingosine mimics the mitogenic effect of sphingosine-1-phosphate in Swiss 3T3 fibroblasts. J. Biol. Chem. 1998;273:23585-89. 3 - Nätzker S, Heinemann T, Figueroa-Perez S, Schnieders B, Schmidt RR, Sandhoff K, van Echten-Deckert G. cis-4-Methylsphingosine-phosphate induces apoptosis in neuroblastoma cells by opposite effects on p38 and ERK MAPKs. Biol. Chem. 2002;383:1885-94. Sphingosine kinase activity is required for sphingosine-mediated phospholipase d activationin C2C12 myoblasts. Sphingosine (Sph) has been implicated as modulator of membrane signal transduction systems and as regulatory element of cardiac and skeletal muscle physiology but scarce information is presently available on its precise mechanism of action. Recent studies have shown that sphingosine 1-phosphate (S1P), generated by sphingosine kinase (SphK) action on Sph, possesses also biological activity, acting as intracellular messenger as well as extracellular ligand for specific membrane receptors. At present however, it is not clear whether biological effects elicited by Sph are attributable to its conversion into S1P. In the present study this issue has been investigated. C2C12 cells were routinely grown in DMEM supplemented with 10% fetal calf serum in an atmosphere of 95% air 5% CO2. For their differentiation into myotubes confluent cells were shifted to low serum medium (DMEM added with 2% horse serum). Mature phenotype was obtained after 5-6 days. Initially, sphingosine (Sph) was examined for its ability to activate phospholipase D (PLD), as observed in other cell types (1). Indeed, 1mM Sph appreciably stimulated PLD activity. Intriguingly, stimulation of PLD by Sph was found to be inhibited by pertussis toxin (PTx), as also observed for S1P-induced PLD activation (2) and could not be detected in differentiated C2C12 cells, in which S1P is uncoupled from PLD stimulation (3), supporting the hypothesis that a common pathway accounts for the action of both sphingoid bases. Furthermore, experiments performed in C2C12 myoblasts overexpressing S1P2 or in which endogenous receptor was down-regulated by specific antisense oligonucleotides, were in favour of a major role of S1P2 in the activation of PLD by Sph. Moreover, Sph-induced activation of PLD was inhibited by N,N-dimethyl-D-erythro-sphingosine (DMS), at concentrations capable to block specifically SphK. The crucial role of SphK-derived S1P in the activation of PLD by Sph was confirmed by the observed potentiated effect of Sph in myoblasts where SphK1 was overexpressed and the attenuated response in cells transfected with the dominant negative form of SphK1. Notably, the in vivo measurement of S1P formation by employing labelled ATP revealed that cell-associated SphK active in the extracellular compartment largely contributed to the transformation of Sph into S1P, being negligible the amount of SphK released into the medium. It will be important to establish whether the here identified mechanism of action is implicated in the multiple biological effects elicited by Sph in muscle cells. Spiegel S and Milstien S. Sphingoid bases and phospholipase D activation. Chem. Phys. Lipids 1996;80: 27-36. Meacci E, Vasta V, Donati C, Farnararo M, Bruni P Receptor-mediated activation of phospholipase D by sphingosine 1-phosphate in skeletal muscle C2C12 cells. A role for protein kinase C. FEBS Lett. 1999; 457: 184-188. Meacci E, Cencetti F, Donati C, Nuti F, Farnararo M, Kohno T, Igarashi Y, Bruni P. Down-regulation of EDG5/S1P2 during myogenic differentiation results in the specific uncoupling of sphingosine 1-phosphate signalling to phospholipase D. Biochim Biophys Acta 2003; 1633:133-142. Involvement of sphingosine in glucocorticoid-induced apoptosis of thymocytes. Lépine S,* Lakatos B,*† Courageot M-P,* Le Stunff H,§ Sulpice J-C,* Giraud* F.
*Biomembranes et Messagers Cellulaires and §Activation Cellulaire et Transduction des Signaux,CNRS UMR8619,Université Paris XI-Orsay, France; †present address: Department of Biochemistry and Microbiology, Slovak University of Technology, Bratislava, Slovak Republic. During the selection process in the thymus, most thymocytes are eliminated by apoptosis through signaling via TCR or glucocorticoids. The involvement of ceramide (Cer) and sphingosine (SP), important apoptotic mediators, remains poorly defined in glucocorticoid-induced apoptosis. We report that, in mouse thymocytes, apoptosis triggered by 10-6 M dexamethasone was preceded by a caspase-dependent Cer and SP generation, together with activation of acidic and neutral ceramidases. Apoptosis was drastically reduced by blocking either sphingolipid production (by acid sphingomyelinase inhibitor) or SP production (by ceramidase inhibitors), but not by inhibition of de novo Cer synthesis. Thus, SP generated through acid sphingomyelinase and ceramidase activity would contribute to the apoptotic effect of dexamethasone. Consistent with this hypothesis, SP addition or inhibition of SP kinase induced thymocyte apoptosis. Dexamethasone induced a proteasome-dependent loss of mitochondrial membrane potential DYm and caspase-8, -3 and -9 processing. Apoptosis was abolished by inhibition of DYm loss or caspases-8 or -3, but not caspase-9. DYm loss was independent of SP production and caspase-8, -3 and -9 activation. However, inhibition of SP production reduced caspase-8 and -3, but not caspase-9 processing. Proteasome inhibition impaired activation of the three caspases, whereas inhibition of DYm loss solely blocked caspase-9 activation. These data indicate that dexamethasone-induced apoptosis is mediated in part by SP which contributes, together with proteasome activity, to caspase-8/-3 processing independently of mitochondria, and in part by the proteasome/mitochondria pathway, although independently of caspase-9 activation. Acid ceramidase controls daunorubicin resistance of human hepatoma cells via the ceramide/sphingosine-1-phosphate switch. 1 Liver Unit, Institut de Malalties Digestives, Hospital Clínic i Provincial, Institut d’Investigacions Biomèdiques August Pi i Sunyer, 2 Institut Català d’Oncologia, Hospital Duran i Reynals, Granvia Km 2.7, 08907 Hospitalet, and 3Departmento de Patología Experimental, Instituto Investigaciones Biomédicas Barcelona, Consejo Superior de Investigaciones Científicas, Barcelona, 08036, Spain. Correspondence JC F-Ch (Liver Unit, Hospital Clinic, C/Villarroel, 170, 08036-Barcelona, checa229@yahoo.com). Sphingolipids comprise a family of bioactive lipids that have been described to regulate and mediate diverse cellular functions with opposing outcomes such as in cell proliferation and growth arrest (1-3). In this regard, ceramide and sphingosine-1-phosphate (S1P), play an antagonizing role in cell death. Since ceramidases contribute to the conversion of ceramide to S1P, we analyzed the role of acid ceramidase in the response of tumor cells to chemotherapy. We report that daunorubicin (DNR) selectively stimulated acid ceramidase, decreasing the cellular ceramide to S1P balance. Acid ceramidase silencing by small interfering RNA or inhibition by N-oleoylethanolamine (NOE) enhanced the ceramide/S1P ratio, sensitizing human hepatoblastoma cell lines HepG2, SK-Hep, Hep-3B and human colon HT-29 cells to DNR-induced apoptosis. The sensitisation to DNR by NOE was reversed by extracellular S1P via a pertussis toxin-independent mechanism. The combination of DNR plus NOE resulted in ultrastructural changes in mitochondria, triggering reactive oxygen species generation, cytoplasmic release of Smac/DIABLO and cytochrome c, and caspase-3 activation. Importantly, the apoptotic potential of DNR plus NOE was selective for liver tumor cells, as primary hepatocytes were insensitive to DNR with or without NOE. Thus, acid ceramidase mediates the resistance of tumor cells to DNR through the sphingolipid ceramide/S1P rheostat and hence its antagonism may be of therapeutic value. 1. Obeid, LM, Linardic CM, Karolak LA, Hannun YA.Programmed cell death induced by ceramide. Science.1993. 1769-1771. 2. Hannun YA, and Obeid LM The Ceramide-centric universe of lipid-mediated cell regulation: stress encounters of the lipid kind. J. Biol. Chem. 2002. 277:25847-25850. 3. Spiegel S, andMilstein S. Sphingosine-1-phosphate: an enigmatic signaling lipid. Nat. Rev. Mol. Cell Biol. 2003. 4:397-407. Biological activity of resveratrol via ceramide signaling. Resveratrol (3,4',5-trans-trihydroxystilbene) is a polyphenol small molecule, naturally occurring in a variety of dietary vegetables (roots, peanuts, grape skin) and produced by plants in response to external stresses such as UV and pathogens attack. In human cells, resveratrol treatment affects a variety of cellular targets and the compound acts as anti-oxidant, radical scavenger, anti-inflammatory and antitumoral agent. Plants produce resveratrol to eliminate injured cells via an apoptotic mechanisms; similarly resveratrol induces apoptosis in human cancer cells, in a dose dependant fashion. We demonstrated that in human tumors of different origins (mammary adenocarcinoma, prostate carcinoma and melanoma) resveratrol treatment induces accumulation of endogenous ceramide. Ceramide formation is associated with an increased rate of sphingomyelin hydrolysis at plasmamembrane (nSMase) and of de novo synthesis of sphingolipids. Impairing ceramide accumulation, via metabolic inhibitors, rescued from resveratrol induced cell death. Thus ceramide is a necessary mediator of resveratrol-induced apoptotic mechanism. Since many chemotherapic agents that are effective in cell culture do not show equal efficacy in vivo, due to intrinsic resistance and reduced exposure to drugs of a solid tumoral mass, we tested resveratrol effect on a three dimensional culture of mammary adenocarcinoma cells. Resveratrol determined impairment of three-dimensional growth, disruption of a grown mass of tumoral cells and death of dispersed cells. Moreover the remaining aggregated cells were not able to proliferate if isolated and re-seeded (colony formation), showing a reduced metastasising activity. Even in three-dimensional culture resveratrol induced ceramide intracellular accumulation that is dose dependent and parallels the cytostatic and cytotoxic effect of the compound. In order to investigate on structure-function relation, resveratrol analogues were administered to prostate cancer cells. Whereas trans-stilbene (no hydroxylated) had no effect on cell proliferation, survival and induction of ceramide intracellular increase, the substitution of methoxyl groups in lieu of hydroxyl-groups resulted in an extremely toxic compound inducing cell death by a non apoptotic mechanism and unable to increase ceramide intracellular content. Piceatannol (3,4,3',5'-trans-tetrahydroxystilbene), another analogue with an additional hydroxyl group, showed biological effects comparable to resveratrol. These results assess that resveratrol antitumoral activity is related to its phenolic moiety that targets, either directly or indirectly, ceramide metabolism. De novo-synthesized ceramide is involved in cannabinoid-induced apoptosis of LeukAemia cell lines. Cannabinoids, the active components of Cannabis sativa and their derivatives, exert a wide spectrum of effects both in the central nervous system and in peripheral locations due to their ability to bind to the specific CB1 and CB2 cannabinoid receptors. During the last few years, research from several laboratories has ravelled the therapeutic potential of cannabinoids as antitumoral agents. However, the mechanisms involved in these antiproliferative actions have been only partially elucidated. Interestingly, cannabinoid-triggered ceramide accumulation has been identified as one of the mechanisms involved in the antitumoral actions of these compounds in gliomas. Here, we employed the human leukaemic cell lines Jurkat and SupT1 -that had been previously shown to undergo apoptosis in response to cannabinoids- to gain insight into the intracellular pathways leading to cannabinoid-induced apoptosis of tumoral cells. For this purpose, cells were incubated with cannabinoids in the presence or absence of several inhibitors and antagonists, and cell viability, apoptosis, ceramide levels and serine palmitoyltransferase activity were determined. Western blot analyses were performed to measure expression, distribution and phosphorylation of several proteins. Challenge of Jurkat and SupT1 cells to different cannabinoid receptor agonists and antagonists show that apoptosis occurs via CB2 receptor. Regarding intracellular signaling, data show that: (i) the pro-apoptotic effect of cannabinoids was prevented by pharmacological abrogation of the ceramide synthesis de novo pathway; (ii) cannabinoid treatment triggered a rapid accumulation of ceramide and a parallel stimulation of serine palmitoyltransferase activity; (iii) activation of c-Jun N-terminal kinase and p38 mitogen-activated protein kinase was observed after cannabinoid challenge; (iv) cannabinoid treatment led to cytochrome c release from mitochondria and to activation of caspase 3. Taken together, these data provide clues about the mechanism of cannabinoid pro-apoptotic action, and point to the involvement of de novo-synthesized ceramide in the process of CB2-induced apoptosis of human leukaemia cells. University of Rome "Tor Vergata". Via Montpellier, 1. 00133 ROMA. Defective frataxin expression in humans causes Friedreich's Ataxia (FA), an autosomal recessive neurodegenerative syndrome characterized by progressive ataxia, dysarthria, skeletal abnormalities, glucose intolerance and cardiomyopathy. Frataxin is a highly conserved mitochondrial protein involved in the biogenesis of iron/sulfur clusters (ISC) and iron homeostasis. Low frataxin levels affect mitochondrial energy metabolism as a consequence of altered biogenesys of ISC enzymes, which include several components of the mitochondrial electron transport chain. FA cells are more sensitive to oxidative stress, yet the involvement of frataxin in cell survival is still obscure. Herein, we show that the transient overexpression of frataxin prevents ceramide-induced ROS accumulation and apoptosis in human tumor cells, with the same efficiency of the anti-apoptotic protein Bcl-2. GD3-mediated apoptosis, driven by GD3 synthase overexpression, is also inhibited by co-transfection of the cells with frataxin. Moreover, differently from Bcl-2, frataxin protects against anti-Fas induced apoptosis. Accordingly, frataxin-deficient FA cells are more sensitive to Fas, ceramide- and GD3-induced cell death. Taken together, these results suggest a protective role of frataxin in apoptosis. Regulation of macroautophagy by ceramide in mammalian cells. 2Laboratory of Biochemistry and Molecular Biology San Paolo Medical School, via Rudini 8, 20142 Milan Italy. Macroautophagy is an evolutionary conserved lysosomal pathway involved in the turnover of long-lived proteins and organelles (1). Macroautophagy starts with the formation of a multilayer membrane bound autophagosome that sequesters fractions of the cytoplasm. In mammalian cells, most of autophagosomes receive inputs from endocytic compartments before fusing with lysosomes where the degradation of the sequestered material is completed. The discovery of a family of genes (ATG: AuTophaGy-related genes. Reviewed in Refs. 2,3) conserved from yeast to humans, and involved in the formation of autophagosomes has shed light on the importance of macroautophagy in physiology (adaptation to starvation, development and longevity) (4) and pathophysiology (cancer, myopathies, neurodegeneratives diseases) (5). The elucidation of the molecular control of autophagy will also lead to a better understanding of the role of macroautophagy during cell death (6). As a great number of extracellular stimuli (starvation, hormonal or therapeutic treatment) and intracellular stimuli (accumulation of misfolded proteins, invasion of microorganisms) is able to modulate the autophagic response, it is not surprising that several signaling pathways are involved in the control of macroautophagy. The class I PI3K/PKB/mammalian Target of Rapamycin (mTOR) signaling pathway plays a major role in transmitting autophagic stimuli because of its ability to sense nutrient, metabolic and hormonal signals (7). Macroautophagy is under the control of different classes of phosphatidylinositol 3-kinases (PI3Ks). 3-methyladenine inhibits the formation of autophagosomes by interfering with the activity of the class III PI3K suggesting that the production of PtdIns3P is required during early steps of macroautophagy (8). By contrast the stimulation of the activity of class I PI3K inhibits the autophagic pathway. The production of PtdIns(3,4)P2 and PtdIns(3,4,5)P3recruits the serine/threonine kinase Akt/protein kinase B (PKB) and its activator the kinase PDK1. This signaling pathway which is involved in many cellular processes including proliferation and cell survival is negatively regulated by the tumor suppressor PTEN which dephosphorylates the D-3 position of PtdIns(3,4)P2 and PtdIns(3,4,5)P3. The overexpression of PTEN counteracts the down-regulation of macroautophagy by the stimulation of class I PI3K signaling pathway whereas the expression of a constitutively active form of PKB has an inhibitory effect on macroautophagy (9). More recently we have shown that the sphingolipid ceramide, which is involved many stress responses, upregulates macroautophagy (10). Exogenous C2-ceramide (C2-Cer) stimulates macroautophagy in the human colon cancer HT-29 cells by increasing the endogenous pool of long chain ceramides as demonstrated by the use of the ceramide synthase inhibitor fumonisin B1. Ceramide reverted the class I PI3K-dependent inhibition of macroautophagy, by interfering with the activation of PKB, and stimulated the expression of the autophagy gene beclin 1 (the ortholog of yeast ATG6) (11). Ceramide is also the mediator of the tamoxifen (TAM)-dependent accumulation of autophagic vacuoles in the human breast cancer MCF-7 cells (12). Myriocin, an inhibitor of de novo ceramide synthesis abrogates the accumulation of autophagic vacuoles in TAM-treated MCF-7 cells. Interestingly, the glucosylceramide synthase inhibitor PDMP mimicked the TAM-dependent accumulation of vacuoles. PDMP, TAM and C2-Cer stimulated the expression of beclin 1 whereas myriocin antagonized the TAM-dependent upregulation of beclin 1 and the PKB inhibition by ceramide. In conclusion, macroautophagy is controlled by the interplay between protein and lipid signaling. The control of macroautophagy by ceramide provides a novel function for this lipid mediator in a cell process with major biological outcomes. 1. Klionsky, D. J., and Emr, S. D. (2000) Science 290, 1717-1721. 2. Ohsumi, Y. (2001) Nat. Rev. Mol. Cell Biol. 2, 211-216. 3. Klionsky et al. (2003) Dev. Cell 5, 539-545. 4. Levine, B., and Klionsky, D. J. (2004) Dev. Cell 6, 463-477. 5. Cuervo, A. M. (2004) Trends Cell Biol. 14, 70-77. 6. Gozuacik, D., and Kimchi, A. (2004) Oncogene 23, 2891-2906. 7. Codogno, P., and Meijer, A. J. (2004) in Autophagy (Klionsky, D. J., ed), pp. 26-48., Landes Bioscience, Georgetown, TX. 8. Petiot et al. (2000) J. Biol. Chem. 275, 992-998. 9. Arico et al. (2001) J. Biol. Chem. 276, 35243-35246. 10. Scarlatti et al. (2004) J. Biol. Chem. 279, 18334-18391. 11. Liang et al. (1999) Nature 402, 672-676. 12 Bursch et al. (2000) J. Cell Sci. 113, 1189-1198. Mutation of CERKL, a novel human ceramide kinase gene, causes autosomal recessive retinitis pigmentosa. Tuson M, Marfany G, Gonzàlez-Duarte R.
Retinitis pigmentosa (RP) is an inherited retinal degenerative disease characterized by the progressive attrition of mature photoreceptor cells through apoptosis, and which eventually results in complete blindness in early adulthood. At present, 38 genes and loci have been implicated in this monogenic, albeit complex, disorder, emphasizing the high genetic heterogeneity of RP. These include genes encoding proteins of the phototransduction cascade, proteins of the visual cycle, proteins responsible for the structure and polarity of the photoreceptors, and regulatory proteins, such as transcription and splicing factors (1). To date, none of the described RP genes have been directly involved in the apoptotic pathways that lead to photoreceptor loss. In the present study, we report a novel RP gene encoding a ceramide kinase enzyme (CERKL), which is responsible for the disease in a Spanish consanguineous family with autosomal recessive retinitis pigmentosa (arRP). Previous linkage analysis in this family allowed us to define a new arRP locus (RP26) within an 11-centiMorgan (cM) interval (17.4 Megabases, Mb) on 2q31.2-q32.3 (2). We further refined the RP26 locus down to 2.5 Mb by microsatellite and single-nucleotide polymorphism (SNP) homozygosity mapping. This 2.5-Mb candidate region harboured nine genes, which were analyzed for mutations, but none showed any pathogenic variant in the patients of this family. Subsequently, an exhaustive gene search based on expressed-sequence-tag (EST) data unveiled two partial sequences corresponding to a novel gene. This new gene spanned 13 exons and encoded a predicted protein of 532 amino acids that shared the highest similarity (29% identity; 50% similarity) with the human ceramide kinase (CERK ). Hence, it was named human ceramide kinase–like (CERKL ). Database searches also revealed two partial murine sequences, which, upon assembly and conceptual translation, produced a protein that was highly homologous to human CERKL (75% identity; 85.6% similarity). The human CERKL coding exons were sequenced in all members of the RP26 family. Remarkably, all patients were homozygous for a nonsense mutation (R257X; CGAÕTGA) in exon 5, which prematurely truncated the protein within the predicted kinase catalytic domain. RT-PCR analysis revealed that human CERKL is expressed in the retina, among other adult and fetal tissues. In situ hybridization on mouse eye sections showed expression of the mouse CERKL ortholog in the retina ganglion cell layer, and a faint signal was also detected in the inner nuclear and photoreceptor cell layers. Nowadays, it is widely accepted that sphingolipid (SL) metabolism plays a fundamental role in the regulation of cell proliferation, differentiation, and apoptosis. Ceramide is at the core of sphingolipid metabolism and is the precursor of complex and bioactive sphingolipids (5). Both the central position of ceramide in SL metabolism and the increasing evidence of its involvement apoptosis highlight the significance of a finely tuned regulation of ceramide levels. Therefore, the enzymes involved in the production and clearance of ceramide must be precisely regulated. Our results suggest that CERKL may play a role in the survival of photoreceptors and other retinal cells. Moreover, recent data support ceramide-1-phosphate as a novel regulator of cell functions (6–8). Within this context, the observation that ceramide-1-phospate prevents the accumulation of ceramide by inhibiting acid sphingomyelinase in macrophages, thus avoiding apoptosis (8), is highly suggestive. Our findings are the first genetic report linking retinal neurodegeneration in RP and ceramide-induced apoptosis, highlight SL metabolism enzymes as functional candidates for retinal disorders and establish novel targets for therapeutic intervention of these diseases. 1. Hims MM, Daiger SP, Inglehearn, CF. Retinitis pigmentosa: genes, proteins and prospects. Dev Ophthalmol. 2003;109-125. 2. Bayés M, Goldaracena B, Martínez-Mir A, Iragui-Madoz MI, Solans T, Chivelet P, Bussaglia E, Ramos-Arroyo MA, Baiget M, Vilageliu L, Balcells S, Gonzàlez-Duarte R, Grinberg D. A new autosomal recessive retinitis pigmentosa locus maps on chromosome 2q31-q33. J Med Genet. 1998;2:141-145. 3. Sugiura M, Kono K, Liu H, Shimizugawa T, Minekura H, Spiegel S, Kohama, T. Ceramide kinase, a novel lipid kinase. Molecular cloning and functional characterization. J Biol Chem. 2002;26:23294-23300. 4. Tuson M, Marfany G, Gonzàlez-Duarte R. Mutation of CERKL, a novel human ceramide kinase gene, causes autosomal recessive retinitis pigmentosa (RP26). Am J Hum Genet. 2004;1:128-138. 5. Hannun YA, Obeid LM. The Ceramide-centric universe of lipid-mediated cell regulation: stress encounters of the lipid kind. J Biol Chem. 2002;29:25847-25850. 6. Pettus BJ, Bielawska A, Spiegel S, Roddy P, Hannun YA, Chalfant, CE. Ceramide kinase mediates cytokine- and calcium ionophore-induced arachidonic acid release. J Biol Chem. 2003;40:38206-38213. 7. Pettus BJ, Bielawska A, Subramanian P, Wijesinghe DS, Maceyka M, Leslie CC, Evans JH, Freiberg J, Roddy P, Hannun YA, Chalfant CE. Ceramide 1-phosphate is a direct activator of cytosolic phospholipase A2. J Biol Chem. 2004;12:11320-11326. 8. Gómez-Muñoz A, Kong JY, Salh B, Steinbrecher UP. Ceramide-1-phosphate blocks apoptosis through inhibition of acid sphingomyelinase in macrophages. J Lipid Res. 2004;1:99-105. Sphingolipid synthesis as a target for anti-T. Gondii drugs. Sphingolipids are ubiquitous components of plasma membranes, where they contribute to the functional heterogeneity of the lipid bilayer. In addition, sphingolipids act as second messengers in important signaling systems that regulate a wide range of cellular functions, including growth and cell cycle, apoptosis and differentiation. Inositol phosphorylceramide (IPC) is a sphingolipid present in plants, yeast, fungi and some protozoa, but is absent in mammalian cells. The synthesis of IPC is an essential process in fungi, as inhibition of IPC synthase causes arrest of cell cycle progression followed by loss of viability. Based on the fact that T. gondii contains an apicoplast, a plant-derived organelle that is involved in lipid synthesis, we tested the effect of Aureobasidin A, a pharmacological inhibitor of IPC synthase, on the parasite. We discovered that Aureobasidin A treatment exerts a significant dose-dependent anti-proliferative effect on T. gondii, without affecting host cell viability. Moreover the presence of the compound inhibits host cell invasion by the parasite. We hypothesize that characterization of the IPC biosynthetic pathways present in T. gondii will (1) provide the first indication of a co-existence of plant-type and animal-type sphingolipid pathways in T. gondii, and (2) provide a potential new target for developing drugs specifically affecting T. gondii with low toxicity for humans. Fabry disease: molecular studies in italian patients and x-inactivation analysis in female carriers. Anderson-Fabry disease is an X-linked lysosomal storage disorder of glycosphingolipid metabolism. This multisystemic disease is caused by a primary deficiency of a-Galactosidase A enzyme (GAL A). The enzymatic GAL A defect leads to accumulation of neutral glycosphingolipids, with terminal linked galactosyl moieties, primarily in vascular endothelium and in tissue lysosomes (kidney cells, neurons, cardiomyocytes). Fabry disease can be classified in two clinical phenotypes: the classic and the cardiac form. The former is mainly characterized, in affected hemizygous males, by angiokeratoma, acroparesthesias, hypohidrosis, pains, fever crises involvement of kidneys, brain and heart and sometimes, as the disease evolves, psychological manifestations with personality disturbances. The latter is characterized by late onset cardiomyopathy and conduction defects. Fabry patients with classic phenotype show a marked reduction in GAL A enzymatic activity, while patients with cardiac variant show residual enzymatic activity. A prevalence of Fabry disease in a referential population of male patients with a clinical diagnosis of late onset Hypertrophic Cardiomyopaty (HCM) has also been reported. Female carriers can be asymptomatic or clinically affected, usually with the mild and late onset form of the disease. They show corneal abnormalities as the most frequent clinical manifestations. Up to now more than 300 mutations have been identified in the GLA gene, mapped on Xq22. Recently, a model of the GAL A enzyme was constructed and 245 genetic lesions were plotted. This structural model could be helpful to predict, from the genetic mutation, the phenotype of the disease. With the aim of a genotype/phenotype correlation and for better patient care and therapeutic management molecular studies were carried out on 24 Italian Fabry patients. Six new (c126-127insCATG, L167P, c617-618delTT, Q279K, c946delG, de novo A352D,) and eleven known (P40L, c124-125delAT, S78X, C174Y, IVS3+1G>A, N215S, R220X, R227Q, W236C, de novo Y365X, C378Y) mutations were identified in the genomic DNA and/or in total RNA of patients’ GLA gene. An aberrant GLA transcript c486-547del62bp, that leads to an early stop codon, was detected in a male patient carrying the IVS3+1G>A splicing defect. These results confirm molecular heterogeneity also in Italian Fabry patients. We also detected GLA gene mutations in 26 females from 19 unrelated families with family history of Fabry disease. Mutation analysis is the only certain method of detecting female carrier status. The diagnosis in male patients can easily be made by enzimatic GAL A assay, while heterozygous females can show normal activity because of X-chromosome inactivation. Random X-inactivation has been reported for the GLA gene. X-inactivation studies in two carrier female monozygotic twins showing a discordant expression of the same mutation of GLA gene were also described. Up to now no further studies on X-inactivation have been carried out on manifesting Fabry carriers. In order to determine an eventual correlation with clinical manifestations in Fabry carriers, X-inactivation studies were carried out on peripheral blood DNA of 26 Fabry carriers. Eleven females showed a random X-inactivation pattern and fifteen showed a moderately skewed and/or skewed X-inactivation pattern. Nine manifesting carriers showed a skewed pattern in favour of the mutant allele, while five asymptomatic carriers showed a moderate and/or skewed pattern in favour of the wild type allele. In these carriers the X-inactivation studies performed suggest a correlation between clinical manifestations and the skewing of X-inactivation. Such studies could be helpful to predict female phenotypes and give useful indications for therapeutic management. Sphingosine 1-phosphate inhibits cell motility of C2C12 mouse myoblasts. A role for S1P2 receptor. Becciolini L, Donati C, Nuti F, Farnararo M, Meacci E and Bruni P.
Migration of skeletal muscle precursor cells is a crucial step in skeletal muscle development and post-lesional muscle regeneration. A number of growth factors including insulin-like growth factor-1 (IGF-1), hepatocyte growth factor and platelet derived growth factor have been shown to regulate positively migration of C2C12 mouse myoblasts (1). Recent studies have demonstrated that sphingosine 1-phosphate (S1P), a lipid mediator capable to exert pleiotropic actions in a variety of cell systems, is a quite unique regulator of cell motility, in that it acts as chemoattractant or chemorepellant, depending on the cell type (2). C2C12 myoblasts bear at least three different S1P receptor subtypes, namely S1P1, S1P2, S1P3 (3) and a number of different signalling pathways are initiated by the bioactive lipid in these cells (4). Here we have investigated the effect of S1P on the cell motility of these cells. For the experiments C2C12 mouse myoblasts were routinely maintained in DMEM supplemented with 10% fetal calf serum in an atmosphere of 95% air 5% CO2. Cell migration was measured in modified Boyden chamber using polycarbonate filters, 8mm pores coated with Matrigel (4). Cells were harvested by trypsinization, washed with serum-free DMEM and were added to the upper wells at 2x104 cells per well. In some experiments cells were transfected with antisense oligodeoxynucleotides (ODN) to individual S1P receptors (5) or with pcDNA plasmid encoding for S1P2 or short interfering RNA to silence S1P2. Agonists were added to the bottom wells of the Boyden chambers. After 2 h at 37°C the filters were fixed with methanol and successively stained with Diff-Quik. The non-migratory cells on the upper membrane surface were removed and the cells which traversed and spread on the lower surface were enumerated using a Nikon microscope. The bioactive lipid (10 nM-1 mM) dose-dependently inhibited random cell motility. Moreover, S1P (1 mM ) exerted a powerful inhibitory effect on the chemotactic response evoked by IGF-1 (10 ng/ml). The inhibition of random motility and of the IGF-1-chemotactic response by S1P resulted to be significantly attenuated in cells loaded with antisense ODN designed to inhibit S1P2 receptor. Interestingly, S1P-induced inhibition of cell motility was appreciably enhanced in S1P2-overexpressing myoblasts. Pertussis toxin treatment (200 ng/ml, 16 h) diminished random cell motility in unstimulated myoblasts but did not affect the S1P-induced biological response, suggesting that the inhibitory effect of S1P does not involve Gi-coupled receptor. These findings are in favour of a major role of signalling downstream to S1P2 receptor in the inhibition of skeletal myoblast motility induced by S1P. Chargé SBP and Rudnicki MA. Cellular and molecular regulation of muscle regeneration. Physiol. Rev. 2004; 84: 209-238. Takuwa Y. Subtype-specific differential regulation of Rho family G proteins and cell migration by the Edg family sphingosine-1-phosphate receptors. Biochim Biophys Acta. 2002; 1582:112-120. Meacci E, Vasta V, Donati C, Farnararo M, Bruni P. Receptor-mediated activation of phospholipase D by sphingosine 1-phosphate in skeletal muscle C2C12 cells. A role for protein kinase C. FEBS Lett. 1999; 457: 184-188. Okamoto H, Takuwa N, Yokomizo T, Sugimoto N, Sakurada S, Shigematsu H, Takuwa Y. Inhibitory regulation of Rac activation, membrane ruffling, and cell migration by the G protein-coupled sphingosine-1-phosphate receptor EDG5 but not EDG1 or EDG3. Mol Cell Biol. 2000; 20: 9247-61. Sphingosine 1-phosphate metabolism and fate in cells from the nervous system. Department of Medical Chemistry, Biochemistry and Biotechnology, University of Milan, via Fratelli Cervi, 93, LITA-Segrate, 20090 Segrate, Milan, Italy. E-mail, laura.riboni@unimi.it; fax, +39-02-50330365; phone: +39-02-50330357. Sphingosine-1-phosphate (S1P) has long been known as an intermediate of sphingolipid catabolism. In cells, it originates by phosphorylation of sphingosine catalyzed by sphingosine kinase and can be degraded by S1P lyase. It can also be dephosphorylated back to sphingosine by S1P phosphatase. In different cells, including cells from the nervous system, S1P has emerged as important regulator of different cellular processes including proliferation, shape and apoptosis. This sphingoid molecule is able to act both as intracellular and intercellular messenger, and different membrane receptors for it are expressed in neurons and astrocytes. Notwithstanding this, little is known on S1P metabolism and turnover in cells of the nervous system and in particular on its origin and fate in the extracellular compartment. In this study we investigated S1P metabolism in different cells from the nervous system, including glial, neurons and brain-derived endothelial cells. To this purpose we first performed experiments by feeding cells with radiolabeled sphingosine at different doses (nM-µM). After short time pulse, 3H-sphingosine was rapidly internalized into cells in a similar fashion in all cell types; radioactive S1P was rapidly produced. The amount of 3H-sphingosine that was submitted to phosphorylation varied among cell types and increased with sphingosine doses. In all cells, 3H-S1P was submitted to degradation, detected as tritiated water in the medium. This process represented the major fate of the newly synthesized S1P in both glial and endothelial cells. In these conditions, cell medium analysis revealed the presence of extracellular S1P in all cell types. No sphingosine kinase activity was detectable in the medium, supporting that the different cells can release S1P in the extracellular compartment. In different cells, growth factors and phorbol esters stimulated sphingosine phosphorylation, without affecting its degradation. In parallel, an increase of extracellular S1P was also observed. The administration of the S1P lyase inhibitor 4-deoxypyridoxine caused a marked reduction of S1P degradation, paralleled by an increase of cellular S1P. However, this inhibitor did not affect the levels of extracellular S1P. Within the different cell types, a brain-derived endothelial cell line was found the most efficient in S1P secretion, suggesting a possible role for these cells in contributing to the extracellular S1P levels in the nervous system. In further experiments, aiming to evaluate the turnover of extracellular S1P, 3H-S1P (50nM-5µM) was administered to cells for different times up to 1h. At all concentrations, 3H-S1P was efficiently taken up in a time-dependent fashion and about 40% of the administered radioactivity was found incorporated into cells at 1h pulse. However, intracellular 3H-S1P represented only a minor portion of the cell-associated radioactivity, the majority being associated to N-acylated sphingolipids (prevailing at lower doses), and tritiated water (prevailing at higher doses). In the presence of deoxypyridoxine, no difference in the uptake of S1P was detectable even if a marked decrease in radioactive water was observed. In this condition cellular S1P accumulated, accounting for about 50% of total uptake. Collectively, our results demonstrate that cells from the nervous system are able to: a) regulate their S1P levels in a rapid and efficient manner; different enzymes characterized by different capacity and localization appear to be involved; to b) release in (and take up from) the extracellular compartment S1P; their metabolic equipment is also implicated in the rapid turnover of extracellular S1P. Grant support: Italian Ministry of University, Scientific and Technological Research PRIN 2002 to L.R. Sphingolipid metabolism in mitochondria and MAM purified from rat liver. GSLs biosynthesis starts with the formation of ceramide in the endoplasmic reticulum (ER) which is transported by controversial mechanisms to the Golgi apparatus where stepwise addition of monosaccharides onto ceramides takes place. We have reported the presence of GSLs biosynthetic enzymes in a subcompartment of the ER previously characterized and termed as “mitochondria-associated-membrane” (MAM). MAM is a membrane bridge between the ER and mitochondria that is involved in the biosynthesis and trafficking of phospholipids between the two organelles. Using exogenous acceptors coated on silica gel, we demonstrate the presence of ceramide-glucosyl transferase (Cer-Glc-T), glucosyl-ceramide-galactosyl transferase (Gal-T1) and sialyl transferase activities in the MAM. These enzymatic activities were found to represent at least 65% of the activities recovered in the purified Golgi apparatus, although the cross-contamination of MAM by Golgi membranes did not exceed 7.5%. Sialyl transferases activities in MAM led to the synthesis of GM3 ganglioside and small amounts of GD3.. We show that purified mitochondria as well as MAM are able to generate ceramide in vitro through both ceramide synthase or reverse ceramidase, whereas the latter enzyme activity is barely detectable in microsomes. Moreover, ceramide synthase activities were recovered in outer mitochondrial membranes as well as in inner mitochondrial membranes. Using radiolabeled sphingosine as a substrate, mitochondria could generate ceramide and phytoceramide. However, the in vitro sensitivity of ceramide synthase toward fumonisin B1 (FB1) in mitochondria as well as in MAM was found to depend upon the sphingoid base : whereas dihydrosphingosine-N-acyltransferase was inhibited by FB1 in a concentration-dependent manner, FB1 actually activated the ceramide synthase when using sphingosine as a substrate. Acylation of sphingosine-1-phosphate and dihydrosphingosine-1-phosphate generating ceramide-1-phosphate was also shown with both subcellular fractions. Moreover, the same difference in sensivity toward FB1 for the ceramide synthase activities was seen between the two phosphorylated sphingoid bases, raising the possibility that distinct base-specific enzymes may be involved as ceramide synthases. Sphingosine-1-phosphate and liver fibrosis: friend or foe? INSERM U581, Hôpital Henri Mondor, 94010 Créteil, France. Liver fibrosis is the common response to chronic liver injury, and is characterized by increased deposition and altered composition of extracellular matrix. Its progression leads tocirrhosis and its complications (portal hypertension, hepatic failure and hepatocarcinoma), responsible for a high morbidity and mortality. The fibrogenic process is consecutive to migration of the cells to the lesions, intense proliferation and hepatic accumulation of myofibroblasts that synthetize fibrosis components and inhibitors of matrix degradation. These cells also contribute to the development of portal hypertension, due to their contractile properties. We have recently focussed on the role of S1P on the liver fibrogenesis, and used a model of cultured human hepatic myofibroblasts, that we obtain by outgrowth of explants prepared from surgical specimens of normal human liver. We have identified S1P1, S1P2 and S1P3 mRNAs in human hepatic myofbroblasts. These receptors are functional and coupled to pertussis toxin (PTX)-sensitive and insensitive G proteins, as demonstrated in GTPgS binding assays. S1P exhibited pro and antifibrogenic properties of human hepatic myofibroblasts. Antifibrogenic properties of S1P included inhibition of proliferation, migration and of procollagen I mRNA expression, as well as induction of apoptosis. These effects were reproduced by dihydro S1P, indicating a receptor-dependent mechanism. Analysis of the pathways involved revealed that inhibitory effects of S1P on proliferation and migration by S1P were mediated by PGE2 derived from cyclooxygenase-2 (COX-2). Indeed, S1P potently induced COX-2 protein expression. Blocking COX-2 by NS-398, a selective COX-2 inhibitor, blunted both the inhibition of proliferation and of migration by S1P, but did not affect procollagen I mRNA expression. In addition, S1P induced apoptosis of human hepatic myofibroblasts, but this occurred via a receptor-independent mechanism, since dihydro-S1P did not affect hepatic myofibroblast viability. In contrast, S1P elicited profibrogenic properties, since the sphingolipid stimulated a receptor-dependent survival pathway. This antiapoptotic effect of S1P was PTX-sensitive and was mediated by simultaneous, but independent activations of ERK and of PI3Kinase/Akt. In addition, activation of S1P receptors triggered PTX-dependent contraction of human hepatic fibroblasts, that followed increase in intracellular calcium. In conclusion, our results identify S1P as a novel regulator of liver fibrogenesis. The sphingolipid shows both anti and profibrogenic properties. On the one hand, S1P is antifibrogenic since it blunts proliferation, migration and procollagen I mRNA expression via a receptor-dependent pathway, and is proapoptotic via a receptor-independent mechanism. However, S1P is also profibrogenic, by promoting cell survival via a receptor-dependent mechanism. Finally, the contractile properties of S1P suggest that the sphingolipid, by regulating sinusoidal tone, may contribute to the pathogenesis portal hypertension during chronic liver diseases. Elucidation of the S1P receptors that mediate the pro and the antifibrogenic properties of S1P is underway. Role of sphingosine 1-phosphate on NADPH oxidase activation and redox regulation of c-Src in NIH3T3 fibroblasts. Catarzi S., Biagioni C, Favilli F., Giannoni E., Iantomasi T. and Vincenzini M.T. Department of Biochemical Sciences, University of Florence, Viale Morgagni 50, 50134 Florence, Italy. M.T. Vincenzini: Fax 055/4222725; Tel.055/416686; e-mail: vincenzini@unifi.it. Sphingosine 1-phosphate (S1P) belongs to groups of platelet-derived lipid mediators that regulate various biological effects. Extracellular S1P can act through specific G-protein coupled receptors (S1PRs) of the endothelial differentiation gene (EDG) family, in various types of cells including NIH3T3 fibroblasts. In these cells, intracellular S1P is also related to PDGF mitogenic signalling as second messenger and PDGF-induced cell motility by autocrin mechanism of S1PRs stimulation (1). Our previous data demonstrated that S1P and H2O2 production induced by PDGF stimulation are related to tyrosine autophosphorylation of PDGFr (2). Indeed, reactive oxygen species (ROS) such as O2-and H2O2 are signal mediators of various factors including cytokines and growth factors. A multicomponent NADPH oxidase is the enzyme mainly involved in production of ROS (3) and it is widely studied in phagocyte cells, whereas few data on activation mechanisms of this enzyme in non-phagocyte cells are reported. The results of this study demonstrate a time dependent increase of H2O2 content in NIH3T3 fibroblasts after S1P stimulation measured by a fluorescence-based assay with DCF-DA as compared with non-stimulated cells. S1P-induced H2O2 production decreases remarkable in cells pretreated by DPI or AEBSF, specific inhibitors of flavine oxidase and NADPH oxidase respectively, indicating the involvement of this enzyme. Subsequently, we demonstrated using specific inhibitors that also phosphatidylinositol-3-kinase (PI3K) and protein kinase C (PKC) activities, enzymes involved in S1P signalling, are related to the activation mechanisms of NADPH oxidase due to S1P stimulation. Indeed, both PI3K and PKC can contribute to the translocation and assembly of various components of NADPH oxidase in phagocyte cells stimulated by cytokines or other factors, but to date there are not data in non-phagocyte cells after S1P stimulation. Experiments with pertussis toxin, which inactivates Gi-coupled S1PRs, showed that S1P induces H2O2 production through the stimulation of these receptors. Considering that c-Src, non-receptor tyrosine kinase, is related to both PDGFr and S1PRs signalling (4, 5) and is involved in signal events stimulated by ROS (6), we studied the effect of H2O2 production due to S1P stimulation on c-Src activation, in order to clarify the relationship previously found among S1P, H2O2 production and PDGF-induced tyrosine phosphorylation. First results obtained by catalase treatment demonstrate in NIH 3T3 overexpressing c-Src that S1P-induced H2O2 generation in the presence of vanadate (inhibitor of tyrosine phosphatase) contributes to full c-Src phosphorylation and activation as compared with vanadate treated cells alone. c-Src activation is detected by immunoblotting with specific antibody of c-Src activated form that is tyr-416- phosphorylated. The treatment with inhibitors of NADPH oxidase (DPI and AEBSF) decreases c-Src autophosphorylation, suggesting the involvement of this enzyme in S1P-induced c-Src activation. To confirm a possible redox regulation of c-Src kinase activity, we exposed NIH3T3 overexpressing c-Src to 0.5 mM H2O2 for 30 min in the presence of vanadate. The results obtained show under these conditions the phosphorylation and activation of c-Src. Furthermore, no inhibition of tyr 416-phosphorylated c-Src was observed after treatment with the inhibitors of NADPH oxidase, PI3K and PKC activity indicating that S1P activation of these enzymes is an upstream event of c-Src activation. These data demonstrate that S1P and its receptors are involved in NADPH oxidase activation and redox regulation of c-Src kinase activation and these events can be important factors for the cross communication between receptor tyrosine kinase and G-protein coupled receptors. 1. Hobson JP, Rosenfeldt HM, Barak LS, Olivera A, Poulton S, Caron MG, Milstien S, Spiegel S. Role of the sphingosine-1-phosphate receptor EDG-1 in PDGF-induced cell motility. Science. 2001; 291:1800-1803. 5. Conway AM, Rakhit S, Pyne S, Pyne Platelet-derived-growth-factor stimulation of the p42/p44 mitogen-activated protein kinase pathway in airway smooth muscle: role of pertussis-toxin-sensitive G-proteins, c-Src tyrosine kinases and phosphoinositide 3-kinase. Biochem J. 1999; 337:171-177. 6. Yoshizumi M, Abe J, Haendeler J, Huang Src and Cas mediate JNK activation but not ERK1/2 and p38 kinases by reactive oxygen species. J Biol Chem. 2000; 275:11706-11712. Characterization of the ceramide moieties of sphingoglycolipids containing sphingadienine fromhuman brain with Alzheimer's disease by ESI-MS/MS. Colsch B 1,2, Afonso C 2,Fournier F 2, Portoukalian J 3, Tabet JC 2, Baumann N 1. 1INSERM U495, Paris, France; 2CNRS UMR 7613, Paris, France ;3INSERM U346, Lyon, France. We have shown previously by ESI tandem mass spectrometry, that adult mouse brain contains ceramides from galactocerebrosides and sulfatides with both sphingosine and sphingadienine . In this study we were interested in using a similar methodology for a comparative analysis of sphingoglycolipids present in humain brain with Alzheimer’s disease. Lipids extracts were obtained by chloroform-methanol extraction, and Folch partition from human brain. The upper phase containing the gangliosides and a sulfatide fraction were further purified on C18-silicic acid cartridges followed by RP-HPLC separation. The lower phase containing galactocerebrosides and free ceramides were purified using LC-NH2 cartridges. Control of the fractions purity was carried out by HP-TLC. Mass spectrometry characterization was performed by electrospray ionization using both negative and positive mode. An ESI-ion trap mass spectrometer (Bruker Esquire 3000) was used in MSn in order to characterize ceramide structures. A triple quadrupole instrument (Micromass Quattro) was employed in parent and neutral loss scan mode to obtain additional information. By using the same methology that was used in our previous study on mouse brain , we have found that sphingadienine is present in human brain ceramide moieties of the sphingoglycolipids. The relative fatty acid composition is different than what is observed in the mouse with a lower proportion of short chain fatty acids [C16:0 to C22:0 (OH)] and a greater proportion of very long chain fatty acids [C24:1 to C26:0 (OH)]. In Alzheimer's disease, a reduction of the most abundant sulfatide species and an increase of ceramides in the total lipid extract has been observed . After purification of the isoforms of sulfatides, galactocerebrosides and ceramides, we have confirmed that the sulfatide abundance was decreased. It concerns both the sulfatides with sphingosine and those with sphingadienine. We have also observed an increase of various ceramide isoforms. References Colsch B, Afonso C, Popa I, Portoukalian J, Fournier F, Tabet JC, Baumann N. Characterization of ceramide moieties of sphingoglycolipids from mouse brain by electrospray-tandem mass spectrometry : identification of ceramides containing sphingadienine. J Lipid Res. 2004, 45: 281-286 Han X, Holtzman D, McKeel D, Kelley J, Morris J. Substantial sulfatide deficiency andceramide elevation in very early Alzheimer’s disease : potential role in disease pathogenesis. J Neurochem 2002, 82 : 809-818. Cytosolic sialidase Neu2 upregulation during PC12 cells differentiation. Unit of Biochemistry, Department of Biomedical Sciences and Biotechnology, University of Brescia, Italy. The cytosolic sialidase Neu2 is known to be involved in myoblast differentiation (1,2). Despite its relative abundance in skeletal muscle, cytosolic sialidase was found also in other tissues, such as liver (3), thymus (4) and, although at low levels, brain (5). RT-PCR experiments and "gene reporter" analysis of a 1.4 Kb fragment of Neu2 rat promoter were performed to obtain the expression levels of Neu2 sialidase in PC12 cells, a favored model to study neuronal differentiation. As a consequence, a Neu2 transcriptional induction during nerve growth factor (NGF), fibroblast growth factor 2 (FGF-2) and epidermal growth factor (EGF) treatments was found in this cell line, whereas the Neu2 transcript was absent in untreated cells. In addition, the expression analysis of four Neu2 deleted promoters revealed a remarkable increase of luciferase activity in NGF treated PC12 cells, suggesting that the Neu2 transcriptional level is highly regulated. Interestingly, the major increase of luciferase activity was found after deletion of a fragment containing a rat dispersed repetitive element, a genomic element able in some cases to modulate transcription and translation efficiency (6). Enzymatic assays revealed a cytosolic sialidase activity only during the early steps of NGF differentiation at days 1-2 of treatment, and the low enzymatic activity strictly correlated with the transcript expression levels observed. As a consequence, PC12 cells stably transfected with an expression vector harboring the rat Neu2 cDNA showed a sialidase activity up to 25-times higher than the NGF induced endogenous activity. These data suggest a possible involvement of cytosolic sialidase Neu2 in differentiation of PC12 cells (7). REFERENCES Sato, K. and Miyagi, T.(1996) Bioch. Bioph. Res. Comm. 221, 826-830. Fanzani, A., Giuliani, R., Colombo, F., Zizioli, D., Presta, M., Preti, A., Marchesini S. (2003) FEBS Lett. 547, 183-8. Miyagi, T. and Tsuiki, S.(1985) J. Biol. Chem. 260, 6710-6. Kotani, K., Kuroiwa, A., Saito, T., Matsuda, Y., Koda, T., Kijimoto-Ochiai, S.(2001) Biochem. Biophys. Res. Commun. 286, 250-8. Hasegawa, T., Feijoo Carnero, C., Wada, T., Itoyama, Y., Miyagi, T.(2001) Biochem. Biophys. Res. Commun. 280, 726-32. Landry, J.R., Medstrand, P., Mager, D.L. (2001) Genomics 76, 110-6. Fanzani, A., Colombo, F., Giuliani, R., Preti, A., Marchesini S. (2004) FEBS Lett. 566, 178-82. IGFBP-3 is a survival factor for human endothelial cells and promotes in vitro angiogenesis through activation of sphingosine kinase. Insulin-like growth factor binding protein-3 (IGFBP-3), the major carrier of IGF, exerts either growth promoting or growth inhibiting effects in different cell types. We have previously found that IGFBP-3 inhibits human umbilical vein endothelial cell (HUVEC) apoptosis induced by serum starvation by decreasing the proapoptotic sphingolipid ceramide. Moreover IGFBP-3 was found able to enhance cell motility and to increase IGF-I release, suggesting a new role in endothelial cell survival and angiogenesis. Herein we show that IGFBP-3 (1000 ng/ml) promoted HUVEC survival and inhibited apoptosis in serum-free conditions by activating the enzyme sphingosine kinase (SK). SK catalyses the formation of sphingosine-1-phosphate (S1P), a lipid second messenger implicated in the stimulation of cellular proliferation and inhibition of apoptosis. N,N-dimethylsphingosine, an inhibitor of SK potently blocked IGFBP-3 survival effect, suggesting that IGFBP-3 acts through the SK signaling pathway. Furthermore, IGFBP-3 stimulated the IGF-I receptor (IGF-IR) tyrosine phosphorylation and IGFBP-3 antiapoptotic effect was blocked by the IGF-IR tyrosine kinase inhibitor tyrphostin AG1024. IGFBP-3 even activated the survival pathways PI3K/Akt and ERK which are known to be involved in both IGF-I and S1P signaling. Finally we show that IGFBP-3 dose-dependently induced in vitro formation of vessel-like tubular structures by HUVEC in growth factor-reduced Matrigel. In all, our findings demonstrate that IGFBP-3 promotes endothelial cell survival and inhibits apoptosis via the sphingolipid pathway down-regulating ceramide and activating SK to increase S1P. These effects are likely mediated by the IGF-IR signaling pathway.Enhancement of HUVEC motility and induction of vessel-like structure formation suggest a role for IGFBP-3 to promote angiogenesis. Resveratrol impairs the 3D aggregation of MDA-MB-231 through a ceramide-mediated mechanism. Here we report that ceramide mediates the growth inhibitory effects of resveratrol in MDA-MB-231 cells grown in three-dimensional (3D) cultures. MDA-MB-231 when grown in 3D-cultures can form multicellular spheroids (MCSs). First we treated fully grown MCSs with resveratrol (32 mM, 48 hours) and observed an accumulation of ceramide in the MCSs, in concomitance with the disruption of the most external spheroid cell layer(s) and loss of the clonogenic potential. Second, we observed that treatment of MDA-MB-231 cells with 32 mM resveratrol significantly impaired the formation (number and size) of 3D-MCSs. This effect correlated with a time-dependent accumulation of endogenous ceramide. In addition, cells disaggregated from the few MCSs that were able to form MCSs after resveratrol treatment lost their clonogenic potential. Thus, resveratrol can both reduce full-grown MCSs and prevent the formation of MCSs by triggering ceramide-dependent pathways. These results indicate that resveratrol-ceramide signaling is indipendent from the sovracellular culture level. Sphingomyelin metabolism modifications in response to the effect of high neutron energy. Perrella G.°, Cataldi S.*, Toller M°., Meli A°., Ranaldi F•, Messina C#., Viola Magni M.P. * and Albi E.*. °Department of Experimental and Clinical Pathology and Medicine University of Udine. *Department of Biochemical Science and Molecular Biotechnology, Physiopathology, Perugia. #Dipartimento di Biologia Marina Universita di Trapani. Classic radiation dosimetry, performed with traditional physical methods, does not evaluate the kinetics of radiation absorbance or the biological response(s) to radiation. Those are key aspects in biological systems and cells, which possess elaborate radiation response mechanisms (DNA repair, cellular components turnover, apoptosis, etc.). Biological dosimetry on eukaryotic cell cultures provides nowadays elaborate experimental targets very close to animal and human organs or organisms, which can be used as radiation target systems. In this study, we used FRTL5 cells, strain of normal and differentiated follicular thyroid cells, well characterized, presently an international standard for bioassay of autoimmune thyroid diseases. The FRTL5 cell strain permanently expresses in vitro most of the in vivo tissue-specific thyroid functions, such as for Thyrotropin (TSH) sensitivity for Thyroglobulin synthesis and secretion, Iodide active transport, Peroxidase production, etc. The aim of this study is to investigate the sphingomyelin metabolism modifications in response to neutron irradiation in under the following different physiological conditions: 1) in proliferative state, under Thyrotropin effect. 2) in non proliferative state, in TSH-deprived culture medium. In both conditions the FRTL5 cells have been exposed to neutron irradiation (558 mSv/h) in the laboratory of CERN of Gineva. Moreover for both conditions non irradiated FRTL5 cells have been used as control. The obtained results show that: 1) In the cellular homogenate, exposure of FRTL5 cells to neutron irradiation appears to strongly inhibit the neutral sphingomyelinase activity and to slowlyinhibit sphingomyelin synthase and phosphatidylcholine-dependent phospholipase C activity only in proliferative state. 2) At nuclear level, exposure of FRTL5 cells to neutron irradiation appears to increase significantly the neutral sphingomyelinase activity and to inhibit the phosphatidylcholine-dependent phospholipase C activity in non proliferative cells. No significant effects are reported for sphingomyelin-synthase. We can speculate that the different responses of the high neutron energy on the cellular and nuclear sphingomyelinase and phosphatidylcholine-dependent phospholipase C activities are due to the presence of different isoforms with different functions. In the active proliferating cells the sphingomyelinase produced in the homogenate decreases whereas in the non proliferating cells there is an increment in synthesis of sphingomyelinase in the nucleus and also an inhibition of phosphatidylcholine-dependent phospholipase C activity. In non proliferative cells the data show an incrementof nuclear ceramide and a decrement of diacylglycerol pool, probably involved in cell deth. The correct balance ofceramide and diacylglycerol in the nucleus is essential for cell viability. Alteration in this balance could be related to apoptosis. Dexametasone reduces cell growth via nuclear sphingomyelin metabolism. Department of Biochemical Sciences and Molecular Biotechnology, Physiopathology, Policlinico Monteluce, 06100, Perugia. Corticosteroids have effects on the function of most cells. In the whole animal deficiency or chronic excess is incompatible with survival. Glucocorticoid hormones have been implicated as regulators of T-lymphocyte growth and differentiation e/o apoptosis. Recently studies show that dexamethasone acts via sphingomyelin (SM) metabolism. In fact, it increases SM content, regulates the SM-synthase and sphingomyelinase (SMase) activity. The biological effects of dexamethasone are generally thought to be mediated by an intracellular receptor protein which transduces the hormone signal to the nucleus and participates directly in gene regulation. Since inside the nucleus the metabolism of the SM in relation to cell function has been described, the aim of this work is to establish the possible effects of dexamethasone on cellular and nuclear SM metabolism in tumour cells. At this end, the lymphoma cells (SUP-T1) were seeded in RPMI 1640 in the presence of 10% fetal bovine serum, at a concentration of 100,000/ml and cultivated until 6 days in a 5% CO2 humid atmosphere.Two lots of 5 ml were prepared: one control and one cultivatedin the presence of dexamethasone (500mg/ml). The cell growth was monitored and theSMase and SM-synthase assayed in the homogenate and nuclei. The results show a growth inhibition of 66% after dexamethasone treatment respect to the control cells. In the same cells an increase of homogenate SMase activity reachs a peakafter 2 hours when the SM-synthase activity is inhibited. The nuclear SMase activity show aprogressiveinhibition between 2 and 24 hours. It is possible that the dexametasone inhibits the cell growth acting not only on cellular sphingomyelin metabolism enriching early the ceramide pool but also on nuclear SM. The inhibition of nuclear SMase induces a reduction of nuclear ceramide pool and an increase of SM. Since it may be postulated that SM acts by stabilising chromatin structure, it is possible that changes in nuclear SMase activity may be involved in the regulation of cell cycle not through the action of ceramide production but through the influence of SM at the level of chromatin structure. After dexamethasone treatment, SM could contribute to favour chromatin clamps formation in apoptotic process. Cholesterol/sphingomyelin relationships in oncohaematologic patients. Pugliese L., Bernardini I., Viola Magni MP,Albi E.
Cholesterol (CHO) is a molecule widely distributed in living organisms. It is located mainly at the level of cell membranes in the unesterified form and in the blood as a component of lipoproteins mainly in the esterified form and it has a role in many physiological and pathological processes. Numerous studies have shown that a strong interaction exists between unesterified CHO and sphingomyelin (SM) which arises from the van der Waals interaction between CHO and the saturated lipid acyl chains. The cellular concentrations of SM and CHO are positively correlated in several pathological and experimental conditions. The CHO-SM relation suggests a mechanism for sterol distribution in which sterol levels are determined by the intrinsic characteristics of each membrane. Epidemiologic studies have indicated a relation between lipids and cancer and abnormal blood lipid profiles have been reported in human malignancies. Statistically significant values of CHO were reported in oncohaematologic patients. A significant increase in CHO levels was observed in all patients responding to therapy. The aim of this work was to highlight if the low CHO levels in patients with Monoclonal Gammopathy are accompanied by modification in the SM level. Blood samples of hospitalized patients with Monoclonal Gammopathy with low CHO level (Experimental) were collected. Patients with Monoclonal Gammopathy with a normal CHO level were used as control (Control) . Serum samples were stored at -20°C until used. The level of CHO and SM was measured in untreated and sphingomyelinase treated samples. The results show that the serum CHO and SM levels in experimental patients are 55% and 61% compared to control. After digestion of SM with SMase in both group of patients a decrease in CHO and an increase in CHO esters, was observed. The effect of SMase on SM hydrolysis was low. After three washings of the inorganic phase with chloroform/methanol and solvent containing NaCl, an increase of CHO and CHO was reported; the values were higher in experimental samples.It is possible that in the patients with Monoclonal Gammopathy there is a metabolic and structural modification of the sphingomyelin which forms a pathological complex with CHO influencing the effect of the therapy. Lipid rafts in hepatocyte nuclei. #Dipartimento scienze biopatologiche veterinarie, Università di Perugia. Lipid composition has been described as being responsible for the presence of domains in the membrane. The main role in the process of domain formation is played by cholesterol (CHO) and sphingolipids.These cholesterol-enriched domains may be stabilised by the presence of saturated alkyl chains of sphingomyelin. Recent biophysical data have provided clues to show that changes in membrane structure are a critical function. Lipid raft microdomains were conceived as part of a mechanism for intracellular trafficking of lipids and lipid-anchored proteins.The composition and function of membrane rafts can be modulated in response to a variety of factors and stress conditions. In fact the membrane rafts are the specific sites for ceramide generation in response to various agonists. Aida et al. (2002, 1) suggest that sphingomyelin-cholesterol microdomains or rafts form a stable lipid matrix, which act as an ordered support for receptor-mediated signaling events. Recently we have demonstrated, inside the nucleus, that the amount of cholesterol is similar to that of sphingomyelin, and it increases in chromatin digested with exogenous sphingomyelinase or proteinaseK, suggesting the existence of a chromatin CHO-SM linked fraction (2). Moreover, during liver regeneration, an increase in chromatin cholesterol was observed between 6 and 18 hours after hepatectomy, when the neutral-sphingomyelinase activity increases and the sphingomyelin-synthase is inhibited. In the present work the first aim was to isolate the lipid rafts from hepatocyte nuclei. After nuclei Triton X-100 treatment, isolation of lipid rafts by sucrose density gradient centrifugation was performedaccording to Danielsen (1995, 3). On isolated rafts, the lipid, sphingomyelinase activity and the electron microscope activitywere studied. The results show that the morphology of lipid rafts is similar to that previously reported for microvillar membrane and they are enriched with spherical vesicles, suggesting that these are the mechanism for intranuclear molecule transport in relation to cell function. The nuclear lipid rafts contain CHO and SM and a high activity of sphingomyelinase is detected. Since the nuclear SM, its metabolites and CHO play a role in inducing cell proliferation or apoptosis, it is possible that their function is due to microdomain organization. Effect of protein kinase C delta on nuclear sphingomyelin metabolism. La Porta C.A.M. *, Cataldi S., Lazzarini, R, Viola Magni,MP., Albi E.
Nuclear sphingomyelin metabolism changes during cell proliferation and apoptosis due to modifications in sphingomyelinase (SMase) and sphingomyelin-synthase (SM-synthase) activity (1). The first enzyme hydrolyses sphingomyelin (SM) to produce ceramide, and SM-synthase forms SM by using the phosphorylcholine of phosphatidylcholine (PC) so producing diacylglycerol (DAG). Until now the mechanism of SM metabolism modification in relation to cell function has not been described. Since the protein kinase C delta (PKC delta) has an inhibitory effect on SMase activity (2), in fact specific antibodies anti PKC delta increase the SMase activity significantly, and SM-synthase activation attenuates SMase-induced signalling (3), the present research was aimed at investigating the effect of PKC delta overexpression on nuclear SM metabolism in relation to the induced apoptotic process. At this end we chose B murine melanoma cells (BL6), that do not express the PKC delta and in which overexpression of this enzyme was induced, as the experimental model (4). The overexpression of such an isoform induces a slight increase of cells into apoptosis and an increase of arrested cells into G0/G1 (4). Radioactive PC and SM were used as precursors for evaluating either PC-PLC or SM-synthase and SMase respectively. Incubation of cell homogenate showed no significant modifications of PC-PLC, SMase and SM-synthase activities whereas in the nucleus inhibition of SMase and activation of SM-synthase were demonstrated in transfected cells. No modifications were found for nuclear PC-PLC activity. In chromatin, isolated from the tumoral mass, the overexpression of PKC delta determined the PC-PLC and SMase inhibition whereas the SM-synthase reached a higher level of the activity than that found in the isolated nuclei. Therefore the PC content decreased and the SM content increased. The decrease in PC was due mainly to the SM-synthase activity whereas the pathway through PC-PLC is inhibited. In conclusion, the overexpression of PKC delta, which in murine melanoma cells shifts from the cytoplasm to the nucleus in relation to cell cycle (5) determines an increase in SM content in whole nuclei, so probably modifying the nuclear membrane structure and a greater increase in chromatin SM which appears to be related to protein synthesis present in the apoptotic process. 1) Albi,E. et al.. J. 2003 Cell Physiol. 196:354-61; 2) Visnjic D et 1999 Biochem. J. 344, 921-928; 3) Hiutema, K. et al. 2004 EMBO J. 23, 33-44; 4) C.A.M. La Porta et al.2000 Melanoma Research 10:93-102; 5)Perego C., et al., 2002. Biochem Biophys Res Commun 294, 127-131. Clinical and genetic heterogeneity in GM1 gangliosidosis patients as a result of alteration in β-galactosidase enzyme and elastin binding protein. A Caciotti,MA Donati, A Boneh1, A d’Azzo2, T Bardelli, S. Malvagia, V Kimonis3, R Parini4, D Antuzzi5, A Federico6, E Zammarchi, A Morrone. A deficiency of the human acid b-galactosidase (GLB1) results in two lysosomal storage disorders: the sfingolipidosis GM1-gangliosidosis and the mucopolisaccharidosis Morquio B disease. The clinical heterogeneity of GM1-gangliosidosis is expressed by three major phenotypes: infantile (type I), late infantile or juvenile (type II), and adult or chronic (type III). To date several therapeutic approaches, including substrate deprivation and treatment with “chemical chaperone” molecules, have been evaluated for some lysosomal storage disorders, but most of these diseases, such as GM1-gangliosidosis and Morquio B, remain untreated. GLB1 gene gives rise to the GLB1 lysosomal enzyme and to the elastin binding protein (EBP), whose primary deficiency is linked to impaired elastogenesis. In addition, galactosugar-bearing moieties have been demonstrated to alter EBP function and in turn to cause impaired elastogenesis. GLB1 forms an high molecular weight multienzyme complex with the glycosidases [beta galactosidase (GLB1), alfa Neuraminidase (NEU1) and N-acetylaminogalacto-6-sulfate sulfatase (GALNS)] and the protease [(lysosomal carboxypeptidase A (PPCA)] inside lysosomes, while EBP is bound to PPCA and NEU1 on cell surface. Here we report the clinical, biochemical and genetic characterisation of 11 GM1 patients covering the entire spectrum of GM1- gangliosidosis phenotypes. Molecular analysis was carried out on the patients' genomic DNA and total RNA isolated from cultured fibroblasts, by direct sequencing of GLB1 cDNA, genomic DNA and enzymatic restriction analysis. With exception of a juvenile patient, carrying the new C230Y and the known R201Hlocalized in a region of GLB1 pre-mRNA encoding only for the lysosomalenzyme, all other genetic lesions identified affect both GLB1 and EBP cDNA and these proteins, altered in function and distribution, contribute differently to the specific clinical manifestations. With the aim of assigning a putative role of these mutated amino acids in the GLB1 stability or catalysis, expression studies and enzyme assays were performed. These studies enabled a genotype/phenotype correlation. Sequence analyses of GLB1 related proteins between species, suggest or confirm correlation between pathological molecular and clinical findings. Expression studies on COS1 cells and Western Blot analyses showed that the identified mutations affect GLB1 enzyme activity and/or stability. In addition, some GLB1 gene mutations do not appear to be stabilized by PPCA probably because these mutations hamper the interaction between GLB1/EBP and PPCA inside multienzyme complex. Impaired elastogenesis in fibroblasts of some patients with infantile form, as detected by elastic fibers assembly by immunofluorescence studies, might be associated with a primary defect of EBP function, given that its normal amount remained unchanged. In a patient with the juvenile form, who shows large urinary keratan sulfate excretion and mutations affecting only GLB1 enzyme, a mild EBP reduction and a decreased elastin deposition were present. These data suggest that the keratan sulfate accumulation leads to secondary EBP deficiency with impaired elastogenesis. In order to study the effect of the GSL biosynthesis inhibitors (NB-DNJ) and of the chaperone molecules (DJG and galactose), the skin fibroblasts of three patients with three different phenotypes were pharmacological supplemented with galactose and galactose inhibitors. Interestingly the GLB1 enzymatic activity assayed in the adult patient’s fibroblasts, cultured in the presence of galactose, showed a considerable increase of GLB1 activity. These results could be useful for the development of therapeutic strategies.